Original Works By Shepard Fairey, Bast, Blek le Rat, Matt Small, Judith Supine and Beejoir to Be Sold. Phillips de Pury & Company is pleased to announce the two forthcoming Saturday@Phillips sales featuring premier examples of urban street art. The two sales will take place in London on September 6 and in New York on October 25. Urban street art has fast become a cultural phenomenon sweeping the UK and Europe with its audacious challenging of authority and cultural norms. Public but anonymous, these artifacts of clandestine performance by artists operating outside the established channels of exhibiting and selling their art, has contributed greatly to the dialogue of the enduring question, "What is Art?" The Saturday@Phillips sales will present two highly curated selections of the best of urban street art available to the market. A selection of original works in a variety of mediums by top urban street artists will include: Bansky, Bast, Beejoir, Blek le Rat, DFace, Faile, Shepard Fairey, Insect, Invader, KAWS, Dave Kinsey, Adam Neate, Nick Walker, Barry Mcgee, Micallef, Skullphone, and Swoon. Saturday@Phillips, London will offer original paintings, prints, drawings, sculptures, mosaics, toys and custom-made LP record covers. The following artists: Borf, Buff Monster, Dave Kinsey, Judith Supine, Bast and Skullphone will be introduced to the auction market for the first time. 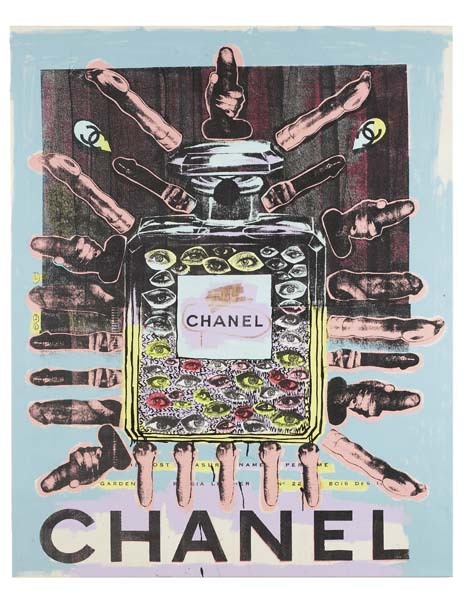 Brooklyn-based artist, Bast will be represented by a mixed media work on canvas, Chanel Bottle Day, 2008 estimated between £6,000 - 8,000. Taking its cue from the Pop art concepts of presenting consumer imagery as art, Bast's rendition of the iconic perfume bottle, boldly painted over and adorned with repeated phallic imagery, has taken on a quasi-ritualistic form and is presented as tribal idol. Beejoir's Fix, 2008 an acrylic on canvas featuring a headless executive set against a gold-leaf background and hung on a crucifix rendered in US Dollar bills, will be offered with a pre-sale estimate of £12,000-18,000. In addition, several examples from Beejoir's "Immodium" series from 2007 which humorously plays off Damien Hirst's Spot paintings, will be offered with estimates ranging from £3,000 - 7,000. Brooklyn collective, Faile, currently on view at the Tate Modern in London's Street Art show, will be represented by a series done between 2005-2006 of works entitled "Forbidden Love" which incorporate collage and appropriated imagery from comic books and pulp fiction. Four of the "Forbidden Love" paintings will be offered with estimates ranging from £10,000 - 25,000. New York City-based Suckadelic has produced a unique toy for the sale, DJ Trooper, an artistic adaptation of the iconic 'Stormtrooper' from Star Wars. This 12-inch art toy made exclusively for the Saturday@Phillips sale depicts the DJ in 1:6 scale wearing a custom track suit and mini-headphones, spinning his collection of records on a double turntable stand. DJ Stormtrooper is estimated between £750-1000. In addition to urban art, Saturday@Phillips will be offering design, contemporary art, photographs, art toys and vintage watches. An auction of contemporary culture, Saturday@Phillips is a quarterly auction conducted by the cutting-edge contemporary art company, Phillips de Pury & Company. Contemporary art, design, photographs, jewelry, watches and toys in addition to fashion and printed matter, are carefully selected by experts at Phillips de Pury & Company and offered with affordable estimates. The sale takes place four times a year in New York and London at Phillips de Pury & Company's headquarters. Coffee and bagels are served. 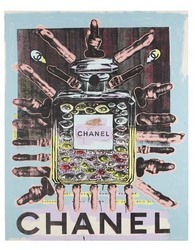 BASTChanel Bottle Day, 2008 Acrylic and screenprint on canvas. 167.6 x 135.3 cm. (66 x 53 1/4 in.) Signed and dated on verso.